Last night on The Great British Bake Off, the latest batch of bakers took on Bread Week with a tasty Chelsea Bun, the technically challenging non-yeast naan bread and a showstopping korovai (an Eastern European bread). 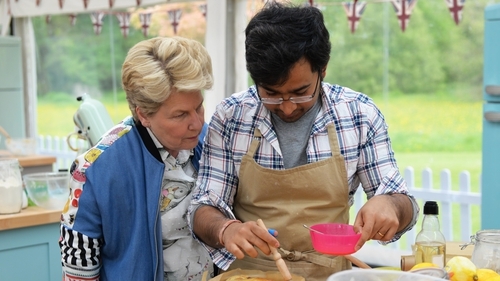 Ultimately, Antony fell flat this week and was asked to leave the tent while Rahul rose to the challenge to become star baker for the second week in a row. "I’m leaving, but still happy tears"
As usual, GBBO fans were on the ball while following the show on Twitter. Here are some of our fav tweets from the night. Rahul: "This is terrible. I am so sorry Paul. This is awful." Paul: "This is the greatest thing I have ever eaten." Imagine trying to explain to a #GBBO novice that a ‘Hollywood Handshake’ isn’t the seal to a lucrative LA contract, but is instead a clammy scouse hand in a muggy tent. Viewers: "Terry, just play it safe. You won the technical. Keep it simple."